Hashtags were introduced by Twitter. They are simply a hash # followed by a word or string of words with no spaces in between. The hashtag groups messages and posts together. So if you were reading on a topic such as business marketing, you could search for hashtags such as #marketing #businessmarketing and find posts on that topic. How to use Hashtags to get More Views on YouTube? Hashtags cannot get you views just because you use them but here is way to get some views. Use trending tags which are related to your content in your videos. Use tags used commonly in your niche so that when people search for a particular topic your video shows up. Also create a tag for yourself and group your videos together. This will work much like a playlist and people can simply search for your hashtag and find all your videos. Hashtags can help you if you use them wisely and here are some ways I am getting my videos noticed using hashtags and how many I use and why. Hashtags can be searched within YouTube. All videos using a hashtag will show up in the search results. Sometimes you might have noticed hashtags either in the title of the video or just above the title of the video. These are hyperlinked and if you click on them they will pull up a search results page for all videos using that particular hashtag. Can your Channel get banned for using Hashtags? Hashtags have to follow the YouTube Community guidelines. If you do anything against community guidelines,your channel can get banned. Here are some other things to keep in mind while using hashtags. Google has listed the following policies regarding YouTube hashtags. Misleading – If the tags mislead, or are used for harassing someone, contain hate speech, have sexual content or vulgar content YouTube will remove your video. How many YouTube tags are allowed? Google Support Forum mentions that you can use up to 15 tags, out of which 3 tags will show up above the video title. If you use too many tags your video can be removed from YouTube. So be very careful about stuffing your videos with tags. The easiest way to find a hashtag is to use YouTube search feature. Type in the symbol hash # followed by your topic. YouTube will suggest hashtags for that topic. I use the most relevant hashtags for my video. 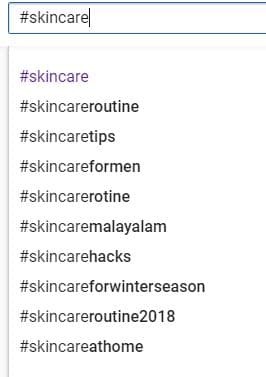 I could also search for other hashtags such as the particular skincare issue this video is addressing. Pick 3 to 5 hashtags for the video. There is a maximum limit of 15 hashtags per video, but I would be wary of using too many. I use only 3 hashtags for each video. So I could search for dogtraining and select the hashtags section. If there are relevant hashtags available it will list those hashtags. How do I create a hashtag? If you do not see a suitable hashtag, you can always create a hashtag. Just pick the best keywords you would like to use and add the hash symbol ahead of them. Once you save the video a new hashtag will be created. I create hashtags when I want to categorize videos together. Something similar to a Youtube playlist. When someone searches for the hashtag, my videos will be shown. This is perfect when I am working on a series of videos under one topic. What is a good hashtag? A good hashtag should capture the essence of your video. It will help categorize videos and help gain visibility for your videos. Another way to use a hashtag effectively is to look for trends. I would suggest looking on twitter. Trends on Twitter are almost the same on Instagram, Facebook and YouTube. Use a relevant trending hashtag in your video. You get short boosts when you can manage to ride a trend. Do not spam by using irrelevant hashtags. Some people use trending hashtags by creating a response video to a trending video and tagging it. So when people search for a hashtag they will find your video also. Create a hashtag for your brand, and also for your topic and subtopics. This way you can group videos together. The more you use the same hashtag, the more you can dominate the search results when people use a particular hashtag. Ask people to use your hashtag by proving them incentives. How do you promote a hashtag? You can promote a hashtag in many creative ways. You can host a giveaway and have people participate in the giveaway by using the hashtag you have created. Another way is to have people make response videos and use the hashtag created by you to say ask a question. If my brand hashtag is #latha, I can create ask people to create videos using hashtag #asklatha to ask me a question on blogging. I can then use that hashtag to search for responses. All participants can be encouraged to share their testimonials,questions, feedbacks as a video using your brand hashtag. Can you Brand a Hashtag? You can use your company name and tagline as a hashtag. Customers can be encouraged to share pictures using your hashtag created using the tagline. People use #haveabreak across all social media platforms including YouTube to share how much they love kitkat. So they have successfully managed to brand the two hashtags. Hashtags are clickable links which will show up. These links can show up above the video or in the title. So when people click on these tags they are taken to the search page showing all videos using that particular hashtag. I have been using the twitter hashtags very effectively to generate traffic to my websites. When you search for a hashtag in twitter, the results are very relevant and are sorted by time. You can also view comments, responses, images, videos in the hashtag search page. YouTube when you search for a hashtag, the results are not based on which videos were posted recently. Youtube shows videos which it wants to promote based on how engaging they feel the videos are. Sometimes the videos are really old and stale. For now YouTube hashtags are just a way to categorize videos, and to ride on trends and join in on conversations on YouTube. 2 Can your Channel get banned for using Hashtags? 2.1 How many YouTube tags are allowed? 3.1 How do I create a hashtag? 3.2 How do you promote a hashtag? 3.2.1 Can you Brand a Hashtag?